December 30, 2008 In News What is Michelle doing now? 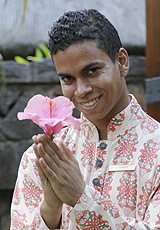 Michelle Chaplow carried out a photographic shoot at one of the world’s most luxurious hotels, The Oberoi, on the idyllic island of Mauritius. 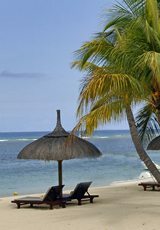 The island of Mauritius is situated in the Indian Ocean 20 degrees south of the Equator. It’s a picture postcard island with turquoise waters and endless white coral beaches with fine white sand. The year round tropical climate and light rain showers translate into abundant flora. There are areas of the Oberoi Hotel that would be the envy of an botanical garden in the world. This hotel prides itself on attention to detail, from immaculate beaches to breathtaking gardens. Each room, pavilion or villa within the hotel is totally secluded giving every guest an individual sense of privacy. The staff is attentive and totally unobtrusive. The infinity pool shaded with exotic frangipanis looking out over the Pointe Aux Piments bay and the volcanic landscape on the headline, the whole scene, a joy to capture on camera. His Royal Highness Prince Felipe of Asturias and Her Royal Highness the Princess of Asturias were guests of honour at the 100th Anniversary of the British Chamber of Commerce in Spain. The event took place in La Caixa Forum Barcelona. The Prince applauded continual and reciprocal British investment in Spain. Michelle was honoured to be introduced to the Prince and Princess during the cocktail preceeding the event. Just in time for Christmas your definitive guide to Spanish tapas has finally arrived. Tapas a Bite of Spain is filled with scrumptious cold salads, sauces, dips and dressings, bite-sized bits of the best Spanish cured hams and aged cheeses, traditional flavours off the griddle and out of the frying pan and a host of options for serving up everything from Spanish potato tortillas to fresh anchovies or autumn mushrooms. Janet Mendel’s newest cook book features only the very tastiest Spanish tid bits accompanied by mouth watering photography by Michelle Chaplow. What’s more, recipes feature both metric and US measurements, making it easy to use on both sides of the Atlantic. An interview with Michelle Chaplow can be viewed here. The five star Hotel La Florida in Barcelona has updated its website with images of the meeting rooms and other selected imagery shot by Michelle Chaplow. La Florida hotel is situated on the Tibidabo mountain behind Barcelona. It offers amazing views to the city of Barcelona and the Mediterranean coastline. This is an oasis from the hustle and bustle of city life, yet convenient for both the business and leisure travellers. 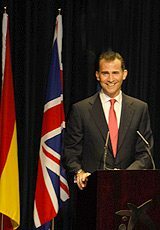 HRH Prince Felipe of Asturias. 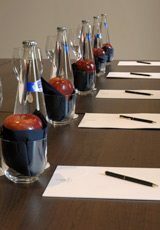 Styled tables for meetings and celebrations @ Hotel La Florida.